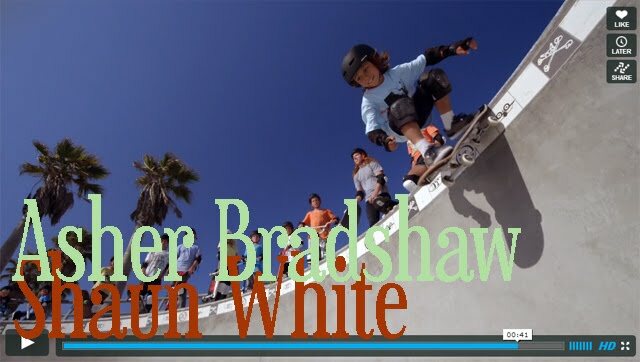 I Skate, Therefore I Am: Asher Bradshaw vs Shaun White? Asher Bradshaw vs Shaun White. Who's winning? I first published a link to a video that was set on "private" by Supply Co, Shaun White's company and had a grand total of 2 viewers in two months. The excellent video realized by Bandito Brothers could not be embeded in any website at all. then, I discovered that there was another video with a different cut (or edit). The video on the top is the official clip, the image is an "embed" and sents you to the "private" clip, so you can watch both the private and official cuts. Anyway you look at it, it's no wonder they don't want this video to be watched by you... It's just prove what everybody at Venice skatepark already new.